^ SSBN K-51 Verkhoturye arrived to Zvezdochka for repairs today. Rusnavy.com. 23 August 2010 [8 October 2010]. ^ JL-1 [CSS-N-3] – China Nuclear Forces. Fas.org. [10 February 2012]. ^ 詹氏：大陸將試驗巨浪3飛彈 採用東風41技術. 联合早报网. [2017-08-08]. ^ EXPRESS EXCLUSIVE: Maiden Test of Undersea K-4 Missile From Arihant Submarine. 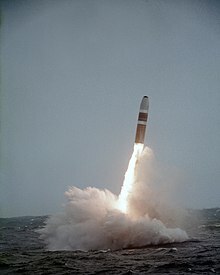 ^ Going nuclear at sea. The Indian Express. 19 March 2015 [11 January 2017]. ^ India's First Ballistic Missile Sub to Begin Sea Trials. The Diplomat. 30 July 2013 [11 January 2017].